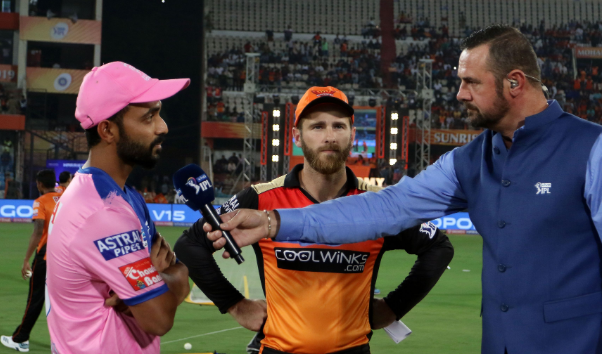 Hyderabad: Rajasthan Royals skipper Ajinkya Rahane says it is difficult for the bowlers to defend any total against a team which has an in-form batsman like David Warner in its ranks. Sanju Samson's (102 not out) century was overshadowed by Warner's blistering fifty as Sunrisers Hyderabad chased down a mammoth 199-run target to beat Rajasthan Royals by five wickets in their IPL match here. "I think first of all, we thought 190 plus was very good score. Initially when Sanju and me were batting the wicket looked slow -- it was stopping and coming -- and we were aiming to get 150 plus. But credit to Sunrisers for the momentum they got in the powerplay. "When someone like Warner (69 off 37 balls) bats like that, it's very less margins for the bowler," Rahane said at the post-match presentation ceremony. "They didn't lose momentum throughout. When he (Warner) got out, Vijay Shankar batted well too," he added. Heaping praise on Samson, Rahane said: "Sanju's been fantastic for us. We all know how talented he is. I'm sure he's also hurt but he'll go miles. Consistency is the key for him." "It was a tough game. Rajasthan Royals played really well to get to that total after the start we had with the ball. It was a brilliant chase. The openers set it up for us. A good collective effort. It certainly wasn't easy. "There are some areas we want to touch up on. We needed many parts to fire to chase near 200. It was a good experience for us as a batting unit to chase it down," Williamson said. "I just try my best to be positive in every game, in every department. I am working hard and believing in my own skills, so that's what is working for me," the star Afghan cricketer said. Talking about Jos Buttler's dismissal, Rashid said: "The plan was to bowl in the good length area to Buttler. As I've got him out a few times previously, so that's why I came in early. "Just tried to bowl in good areas. Didn't want to give room to batsmen because the ball wasn't turning much. I was mixing my variations, just tried my best to mix up my five leg-spinners. I realised it wasn't a wicket where there will be too much turn." Asked about the secret behind his consistent performance in Twenty20 format, Rashid said: "I have five different leg-spin variations with different actions. I just back myself with my variations and pitch it in the good length area." "I am working on my batting. I need to bat well when my team needs me. My coaches -- (Tom) Moody, Murali (Muttiah Muralitharan) and (VVS) Laxman -- have always backed me and given me lot of confidence in the nets saying you can hit anywhere, just a case of backing yourself. That's what I did.